I was so excited to discover this cap, and see the photographs. It has provenence, it is beautifully made, its style is interesting and unique. At Winterthur, the research assistant walked me through many layers of security, locked doors, hidden entrances, to bring me to a workroom with this cap laid out under a cloth. It felt like the big reveal when we pealed back the cloth, and I couldn’t help myself, I cried out, “This is a child’s cap!” It is so small and perfect and jewel-like. So, like the Boston MFA cap, the query here became: could it really be, as the record asserts, an adult wedding cap? This cap is at Winterthur Museum, # 1955.003.013. Their online catalog includes a photo and description. Winterthur Museum record photo. Used with Permission. 3″ by 5″ is a very small caul. 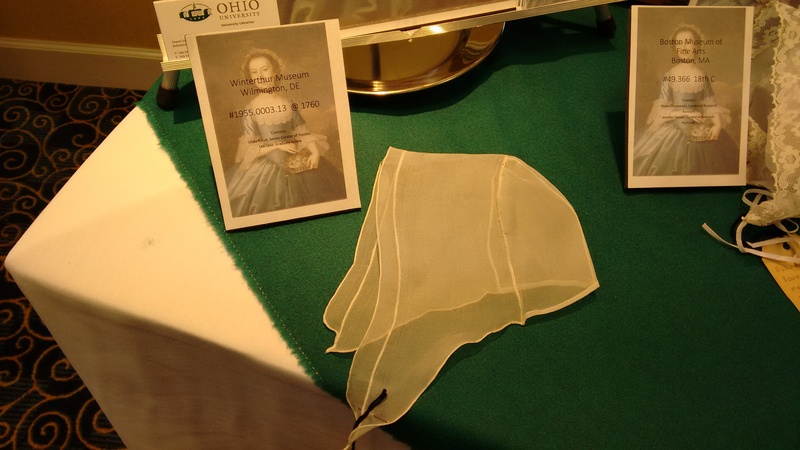 The lappet is only 8 1/2 ” at its tip. The “ruffle,” which isn’t gathered at all, averages 5/8 wide. So all the dimensions are small. The needle work is incredible. Each edge is whipped, then whipped again to join it to its neighbor, creating a little raised edge inside. But what you see on the outside is just 25 perfectly even tiny stitches per inch. The entire finished join measures less than 1/16″ across. The outside edges are rolled, not whipped, to finish. The caul is pieced up the back, and has a 1/8″ casing along the bottom, but no exit holes for gathering strings. The only gather is along the top 5″ of the caul, a perfect miniature rolled gather. The shape of the lappet headpiece and the unruffled ruffle is unique among the examples I’ve seen. The headpiece is cut on the grain, but curved under the ear, ever so slightly. The ruffle is shaped like a bread knife, with the slightly wider part near the ends. Joined, these two pieces make a round end, with the join going right up the middle. Winterthur dates this cap with provenence because it came as part of the collection of needlework made by Mary Alsop (1740-1829), with a note pinned to it, “My Mother’s wedding Cap.” As Mrs. Alsop was married on April 27, 1760, that is the date given the cap. (All this is on the long record of the item.) You can see more of her needlework in the online catalog. The cloth shines like silk, but it is cotton. The cloth is beginning to wear away; several mended places are visible. My study photo. I didn’t get any good detail photos. Is it an adult cap? I noticed when I went back to the record to write this post, that its description is changed now to “child’s cap.” (And then changed back!) It is true that many items that come to us with provenance end up, upon close examination, to be falsely attributed. So maybe her family did not know which cap was really her wedding cap. I’ve also seen in museum records, conflicting accounts by various visiting experts about the date or story for an item. I love that the curators carefully attach all these to the item for the next person to discover, a story gathering over time, perhaps with a conclusion, perhaps not. First, I put my reproduction on the head of Newbold Richardson, (Newbie) who claims she has the “smallest head in the world.” It fits her. True, Newbie has short hair, so there isn’t any bulk under the cap. Also, as I note below, my version is a little off, but not substantially, I think, for fitting purposes. Second, unlike, for example, Boston MFA #49.366, which has gathering strings that will make that cap even smaller when worn, this cap shows no sign of gathers. 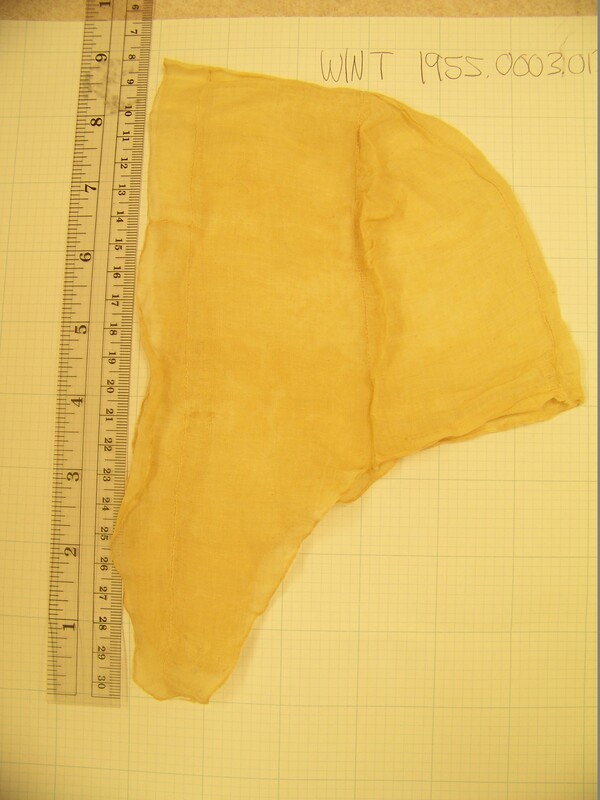 The normal method of sizing by gathering the caul is not being used. This would sit on her head in just this shape, exactly fit for the purpose. And, as Newbie shows us, it is rather nice looking laying simply on her head. It could be worn higher, on dressed hair, with ribbons and flowers, and still look fitted and appropriate. No portraits. No examples. I’ve never seen this shape anywhere else. Have you? I’ve been looking at baby caps in museums (of which there are hundreds! ), websites and books about baby garb, portraits of women and children, both 18th and 19th C sources. I don’t see anything anywhere like this. Which doesn’t help, does it? 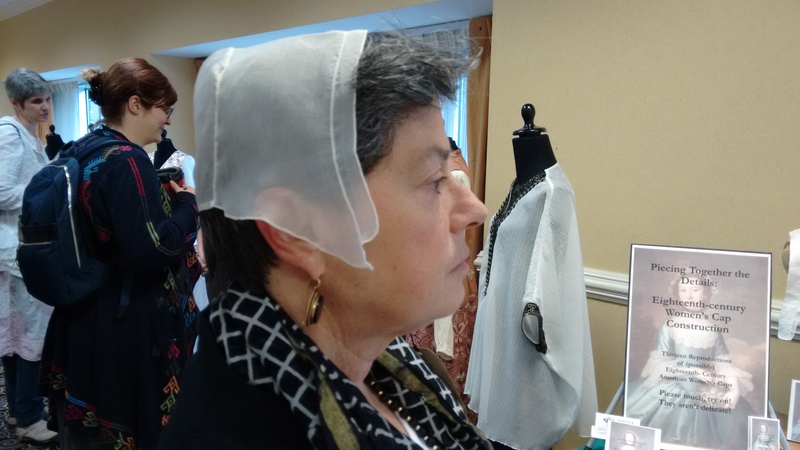 If something is unique — Mary’s one-of-a-kind self-designed custom-fit not-really-fashionable wedding cap — it leaves us at a loss to place it, prove it, or dispute it. Saines repro of Wint 1955.0003.013. As with many caps, one challenge here was reproducing exact 25-stitches-per-inch perfection. I used silk organza to mimic the shiny look of the original. The fineness of that cloth, with silk thread, made it possible to achieve those minute edges. I had some trouble with the shape, especially in the lappet. Mine ended up pointy rather than rounded. And the curves suffer from stretching. I pulled so hard on the cloth to make those tiny rolled edges that some look riffly when they should lie flat. I think I would enlarge the pattern pieces of both the caul and the ruffle to allow more room to work. Linda Eaton, Senior Curator of Textiles, gave me permission to discuss this artifact here. Lea Lane met me at the museum that day and helped me with questions afterward. Museum record photos by Winterthur Museum. Other photos by the author. Thanks for permission from Newbie to show her modelling this cap. The museum record notes this article, which details many other needlework items owned by Winterthur and made by Mary Alsop. This cap is not described in the article. Mary Alsop’s work was part of the museums’ 2009 exhibit, Who’s Your Daddy? This looks remarkably similar to one of the caps published in Sharon Ann Burnston’s _Fitting and Proper_, on collections of the Chester County Historical Society with Quaker provenance. Carrie, I can’t lay my hands on my copy today. Thanks for your comment; I’ll get back to it soon. I can see what you are saying in that the caul is very small and the headpiece is wide (F&P, P. 37), so there is some similarity there. The real differences here are the lappets, of course, and the odd detail that there are no gathering strings.